Thinking of visiting one of the National Parks for your summer vacation? Why not take the road less traveled? 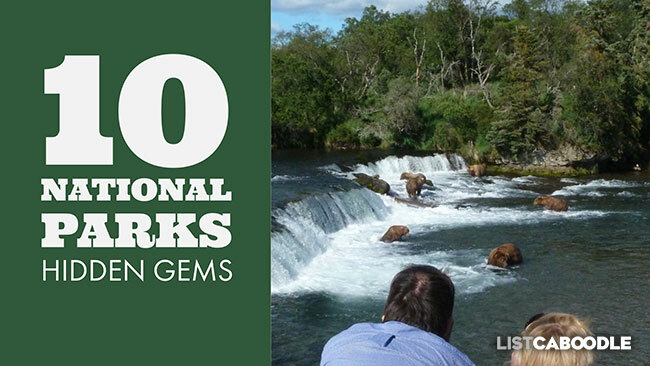 Get off the beaten path and explore some of the least-visited National Parks in the country. You will find soaring vistas, untouched landscapes, and extraordinary natural beauty. And in most cases, you’ll have it all to yourself! It is the northernmost national park. The park lies north of the Arctic Circle. A remote wilderness of untouched natural beauty. Grizzly and black bear, moose, wolf, Dall’s sheep, fox, wolverine and muskox. Long, cold winters and short summers. Mountainous terrain includes the Brooks Range, Endicott and Schwatka Mountains. The Gates of the Arctic Wilderness area. Home to a native Alaska Nunamiut Inupiat village. Dogsledding, backpacking and river running. There are no roads, trails or park facilities. Always take precautions and be self-sufficient. Lies above the Arctic Circle. The largest sand dunes in Arctic: the Great Kobuk, Little Kobuk and Hunt River Sand Dunes. The wetland valley of the Kobuk River. Caribou migration happens twice each year—northward in spring, southward in fall. Backcountry hiking, camping, backpacking, boating and dog sledding. There are no roads or trails in the park. Visitors must be self-sufficient: take precautions and plan ahead. Mountainous terrain includes the active volcano Mount Redoubt. Glacier-fed rivers, lakes (including Lake Clark) and waterfalls. Salmon run from Bristol Bay. Temperate rainforests along the Cook Inlet. A tundra plateau on the western side. Backcountry hiking, camping, backpacking, kayaking and boating. No roads lead to the park. Arrive by boat or floatplane. There is one maintained hiking trail, the Tanalian Trail. Visit the Richard Proenneke Historic Site: a must-see for fans of the television documentary Alone in the WIlderness about Proenneke’s life of solitude in the wild. A National Monument is a protected area in the United States. Similar to National Parks, National Monuments are created from any federal land by proclamation of the President. Well-known examples include Devils Tower in Wyoming and the Statue of Liberty. The furthest point west in Michigan (the nearest city is Thunder Bay, Ontario). Isle Royale is the largest island in Lake Superior. It is actually made up of 400 smaller islands. There are several shipwrecks within the park’s boundaries. The area is known for its wolf and moose populations. The island is a designated UNESCO Biosphere Reserve, or protected ecosystem. Hiking: The Greenstone Ridge Trail runs 40 miles from one end of the park to the other. There are a total of 165 miles of trails within the park. Canoing/kayaking: Scenic waterways include coastal bays and inland lakes. Camping: Windigo and Rock Harbor feature developed sites and facilities. In addition, the park has 36 wilderness campgrounds for the more adventuresome. The North Cascades range features rugged mountain peaks and over 300 glaciers. Includes Mount Shuksan, Mount Triumph, Eldorado Peak and Cascade Pass. Intersected by the North Cascades Scenic Highway. About 500 bodies of water are found within the park. Two designated recreation areas: Ross lake and Lake Chelan. Backcountry hiking and climbing on nearly 400 miles of trails. Camping is available, from wilderness sites to developed campgrounds. Located on the Alaska Peninsula across from Kodiak Island. The Valley of Ten Thousand Smokes, an ash flow formed from the 1912 eruption of Novarupta and Mount Katmai. Home of the largest protected population of Alaskan brown bears. The bears congregate each year near Brooks Falls for the salmon spawn. Animal populations include caribou, wolves, moose and wolverines. Hiking, camping, fishing and backpacking. Water lovers will enjoy kayaking or boat tours. 68 miles west of Key West. Seven islands at the westernmost end of the Florida Keys. Home to the Civil War-era Fort Jefferson, the largest masonry structure in the Western Hemisphere. The Dry Tortugas was named for its lack of freshwater springs and abundance of turtles. It is now a UNESCO Biosphere Reserve. Only accessable by plane or boat. The area is surrounded by undisturbed coral reefs and shipwrecks. Bird watchers will enjoy the large seabird colonies. The continent’s tallest mountains and volcanoes: includes the Chugach, Wrangell and Saint Elias Mountain Ranges. Mount Saint Elias is the tallest at 18,008 feet high. The largest National Park by area. A quarter of the park is covered by glaciers: the Hubbard, Malaspina and Nabesna Glaciers. International Bioshpere Reserve (UNESCO World Heritage Site). Access the Park via the Edgerton Highway along the western edge. Explore Kennecott, an abandoned mining town. Camping at the Kendesnii Campground, managed by the Park Service. Air taxi to backcountry camping sites. Float the Copper, Kennicott, Chitina and Nizina rivers. American Samoa, South Pacific Ocean. The southernmost National Park (the only National Park south of the equator). A tropical paradise made up of three separate islands: Tutuila, Ofu, and Ta‘ū. Terrain includes both volcanic mountains and tropical rainforests. A variety of animal species including flying foxes, brown boobies, sea turtles and over 900 species fish. Over 250 coral species—the largest living coral colonies in the world. Hike the trail to the peak of Mount Alava. Enjoy the beautiful white beaches. The largest old growth hardwood forest in North America. The floodplain forest has some of the tallest trees in the eastern states. Many of the trees are listed on the National Register of Big Trees. The Congaree River flows through the park. A designated UNESCO Biosphere Reserve. Walk the Boardwalk Loop, an elevated walkway that winds through the bottomlands. Bird watching, canoeing/kayaking and hiking through the wilderness. There are a total of 60 National Parks in the United States. The Parks had 84 million visitors in 2017. Operated by National Park Service under the Department of the Interior. A National Park is established by act of the U.S. Congress. The first National Park was Yellowstone, signed by President Ulysses S. Grant in 1872. There are National Parks in 28 states and 2 territories. The state with the most National Parks: California (9). Alaska is second (8). The largest National Park is Wrangell-St. Elias in Alaska. The smallest National Park is Gateway Arch in St. Louis, MO. The westernmost National Park is Kobuk Valley in Alaska. The easternmost National Park is the Virgin Islands. The northernmost National Park is the Gates of the Artic in Alaska. The southernmost National Park is the Virgin Islands. The most visited National Park is the Great Smoky Mountains. The least visited National Park is the Gates of the Arctic in Alaska. Interested in world travel? Check out the 13 Reasons to Make India Your Next Vacation Destination. Or you may enjoy these Top 10 Frightening Commutes. Or, 8 Reasons to Visit Edinburgh, Scotland including Outlander, Arthur’s Seat and Harry Potter.